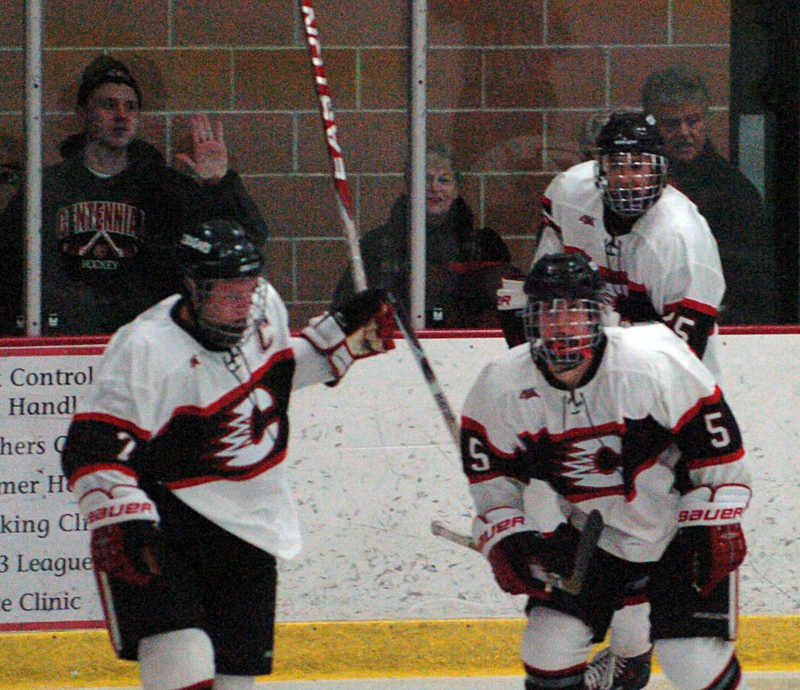 Sticks were high, tempers were short. The bleachers were full and so too, from time to time, were the penalty boxes. This was no ordinary game. Far from it. 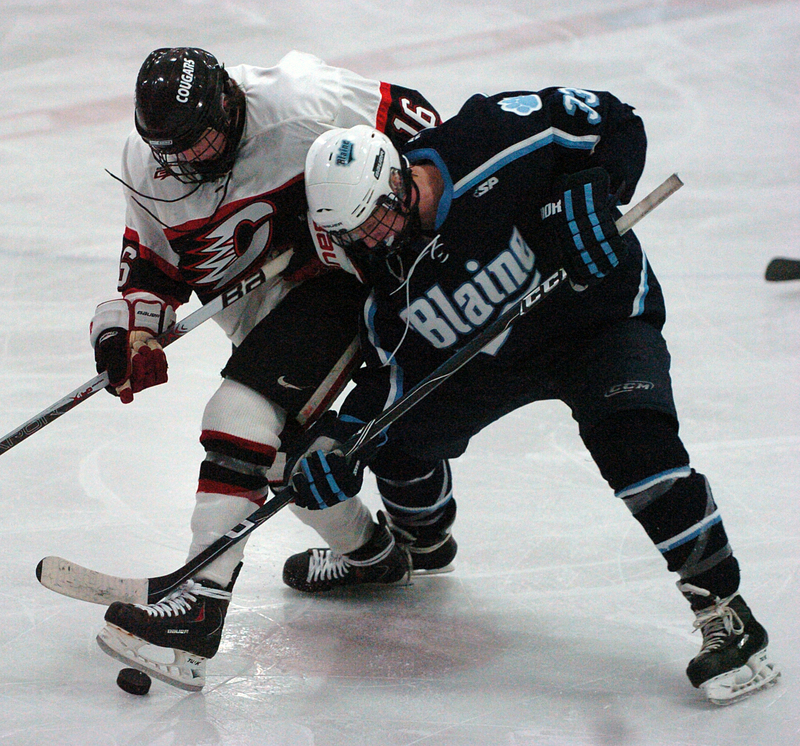 All the ingredients of a great rivalry were there in generous quantities when Blaine, ranked No. 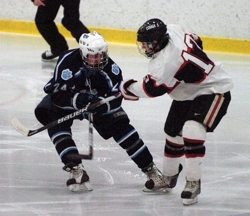 5 in Class AA, and seventh-ranked Centennial met on Saturday, Feb. 13 at the Centennial Sports Arena. 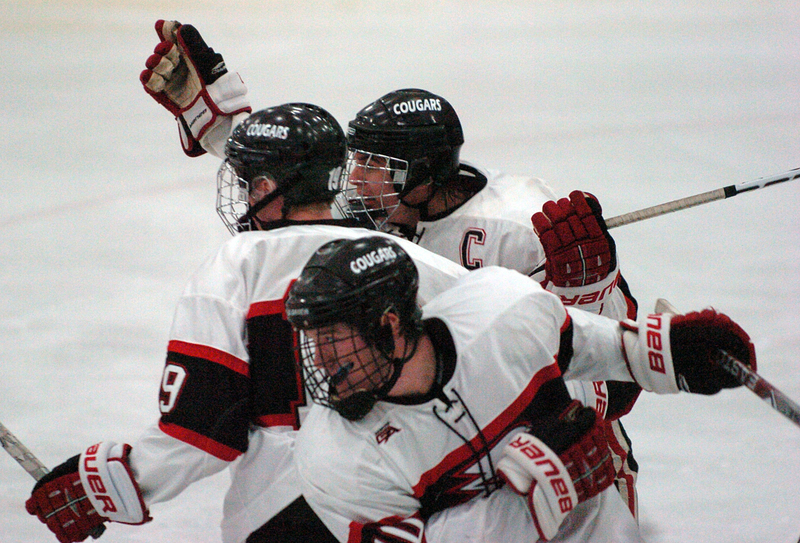 “To me, nothing compares to this,” Centennial goaltender Brett Larsen said about the rivalry after the Cougars gutted out a 3-2 victory over the Bengals. “We live for this every day. You grow up against these guys; we’ve been playing them since we were four or five years old. Hate is a strong word. And an accurate one, too, when summarizing the feelings these teams have for each other. 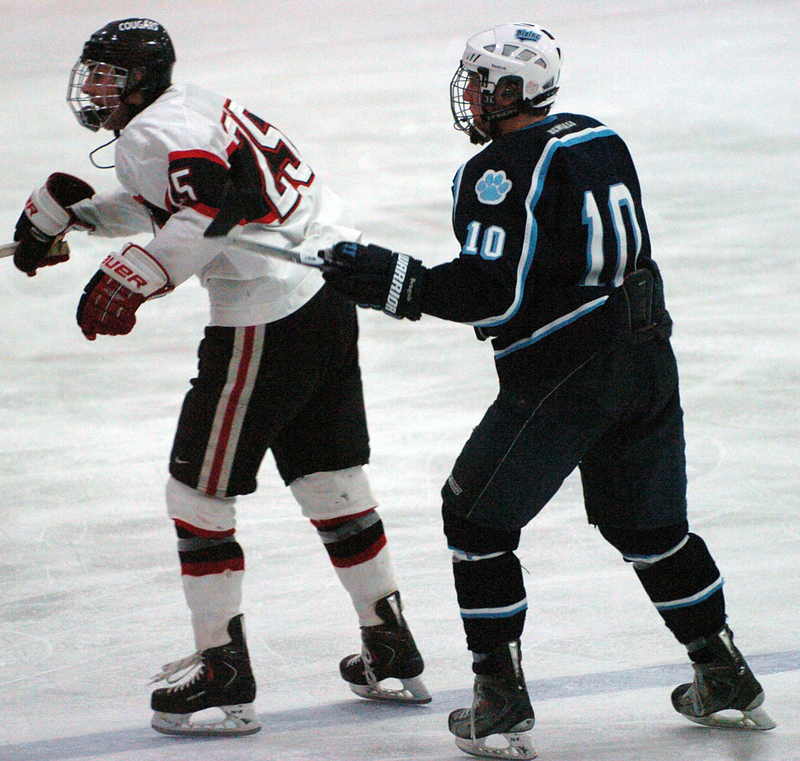 There were five unsportsmanlike conduct penalties called, and there was the same number of roughing infractions. After one second-period shoving match, it took the referees several minutes to sort out which players were getting what penalties. All that bad blood led to all those penalties which, in turn, led to four power-play goals (two for each team). 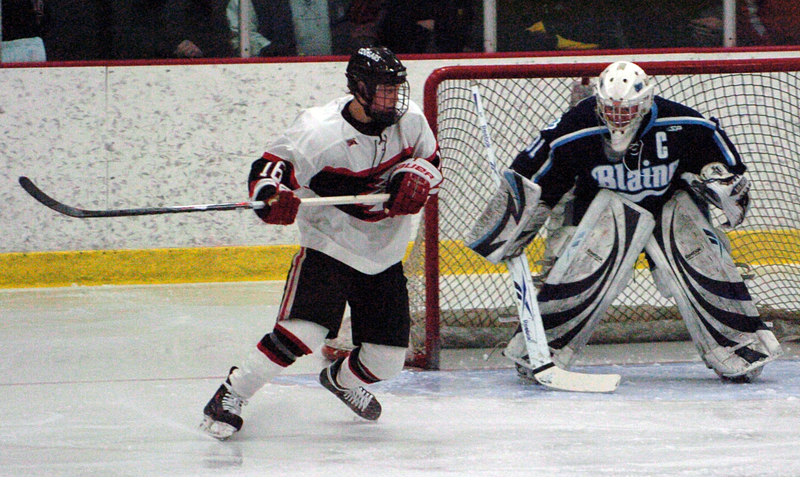 The only even-strength goal of the night happened to be the game winner, scored by Riley Colvard midway through the third period. 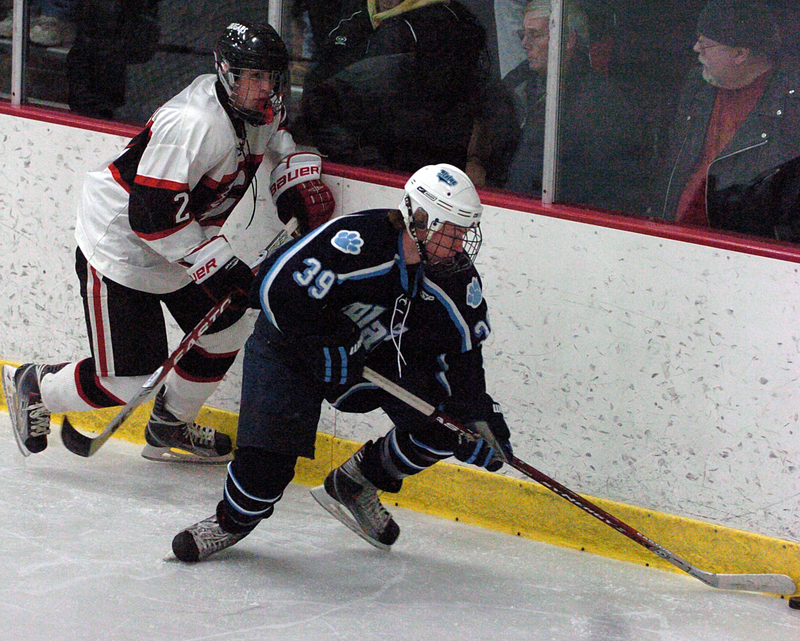 Colvard’s goal was scored from a place Centennial coach Erik Aus calls bloody-nose alley. 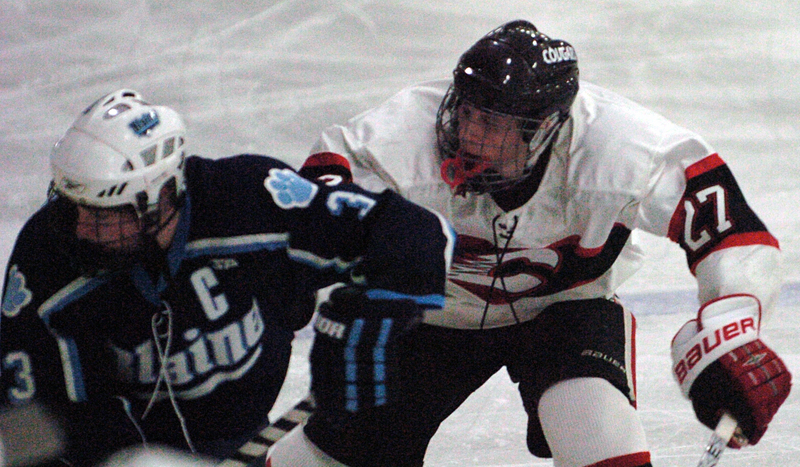 Standing in front of the net is hardly ever a pain-free assignment, and when it’s Centennial vs. Blaine, when all the bumps and bruises are magnified, it can be downright dangerous. 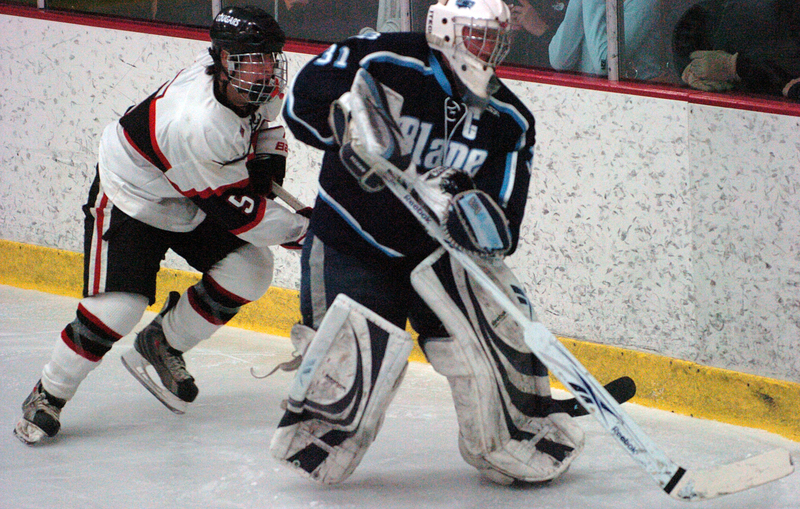 Colvard was standing virtually on top of Blaine goaltender Danny Harper, looking for a rebound after Harper made a save. 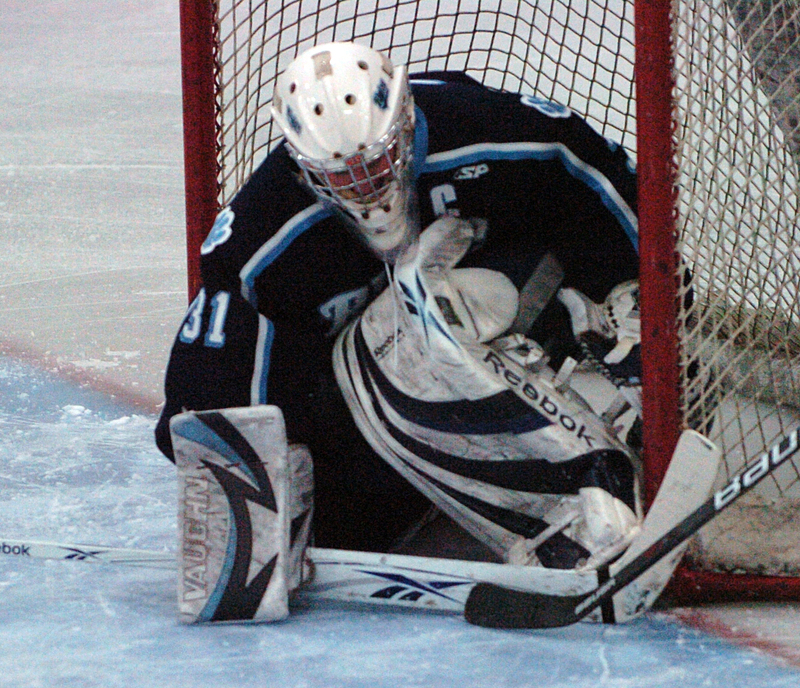 Sure enough, the puck sat in the crease for several seconds before Colvard finally shoveled it into the net. 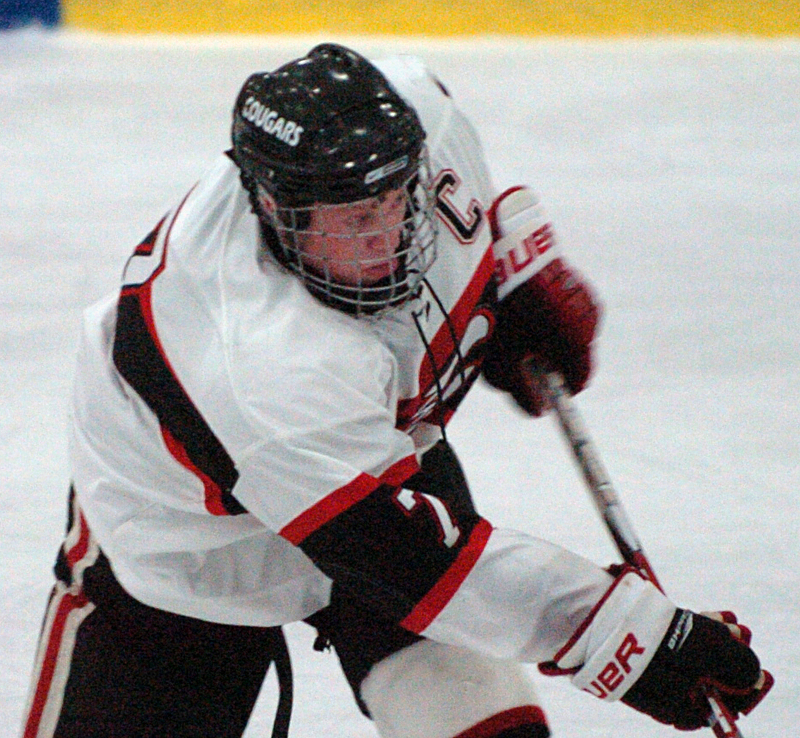 The win extended Centennial’s unbeaten streak to 11 games and tightens both the Northwest Suburban Conference race and the one for the top seed in Section 5AA. 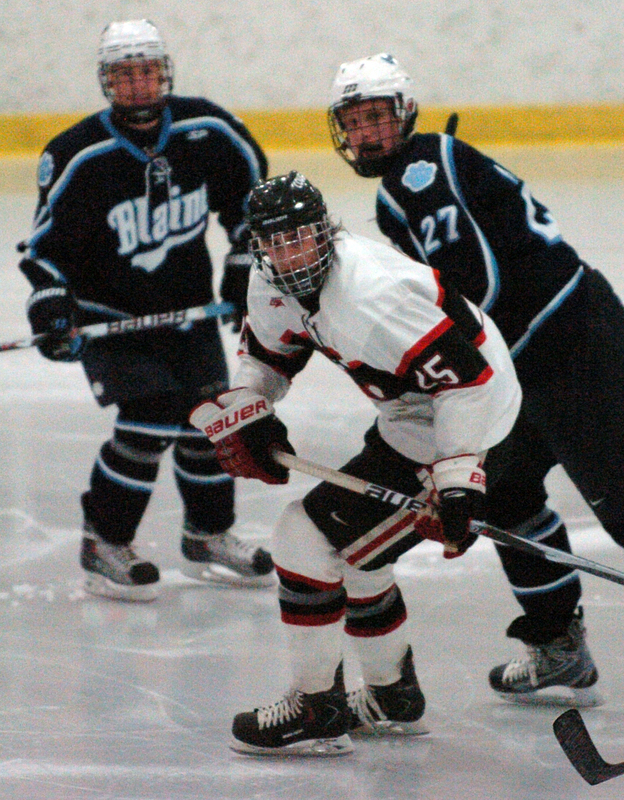 Blaine (13-1-2 in conference, 16-4-3 overall) has a two-point lead over Centennial (12-2-2, 15-5-3) in the conference standings. Head-to-head, though, the Cougars now have the advantage. 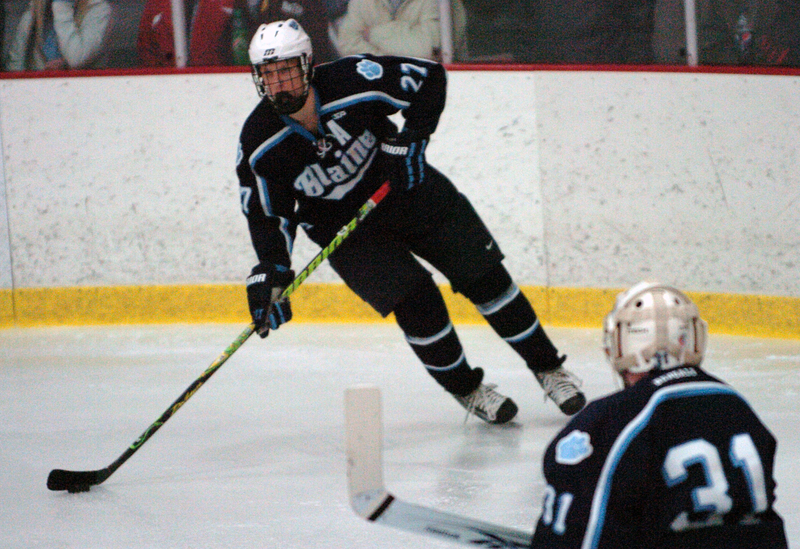 The teams skated to a 2-2 overtime tie earlier in the season. 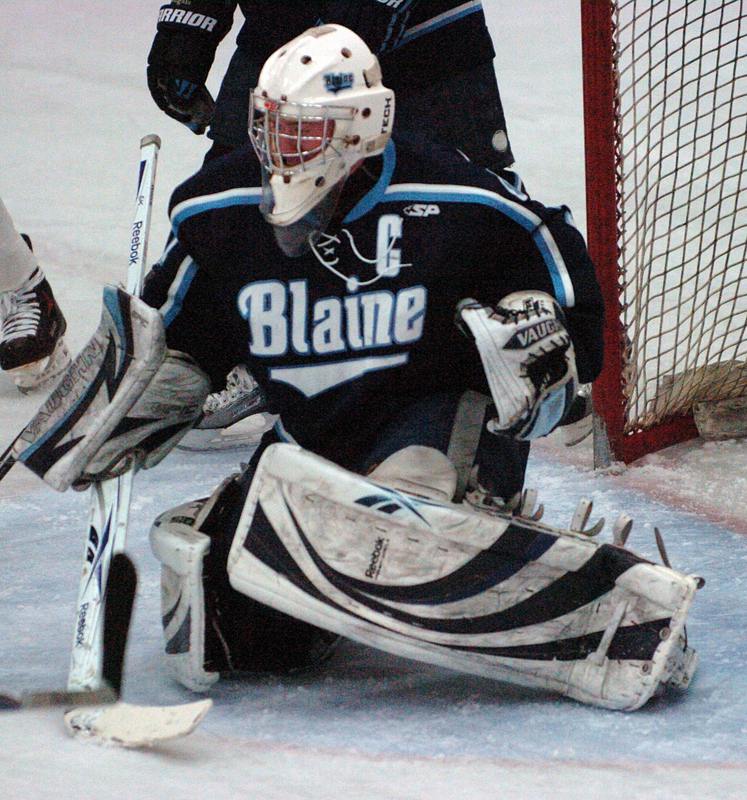 “Tonight we were average at best, and we still were within a goal,” Blaine co-head coach Dave Aus said. “I thought they played pretty well, they had way more energy. 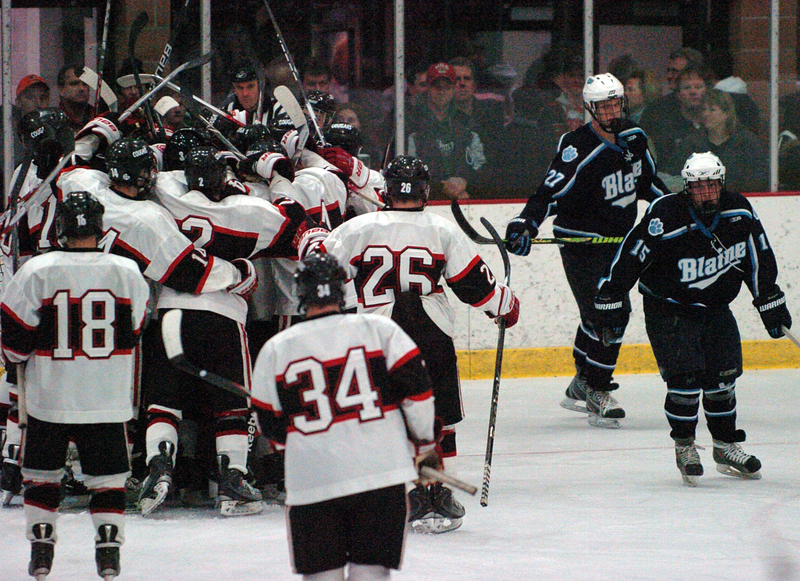 Aus was referencing the section championship game, scheduled for March 5 at the State Fairgrounds Coliseum in St. Paul. 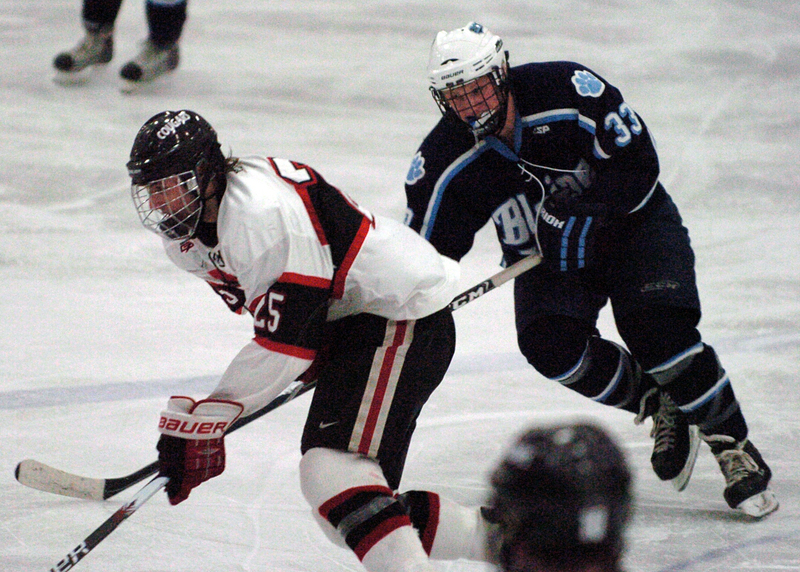 Barring upsets along the way, these teams will likely meet then and there with a coveted state tournament berth on the line. In the meantime, there are bruises to heal. 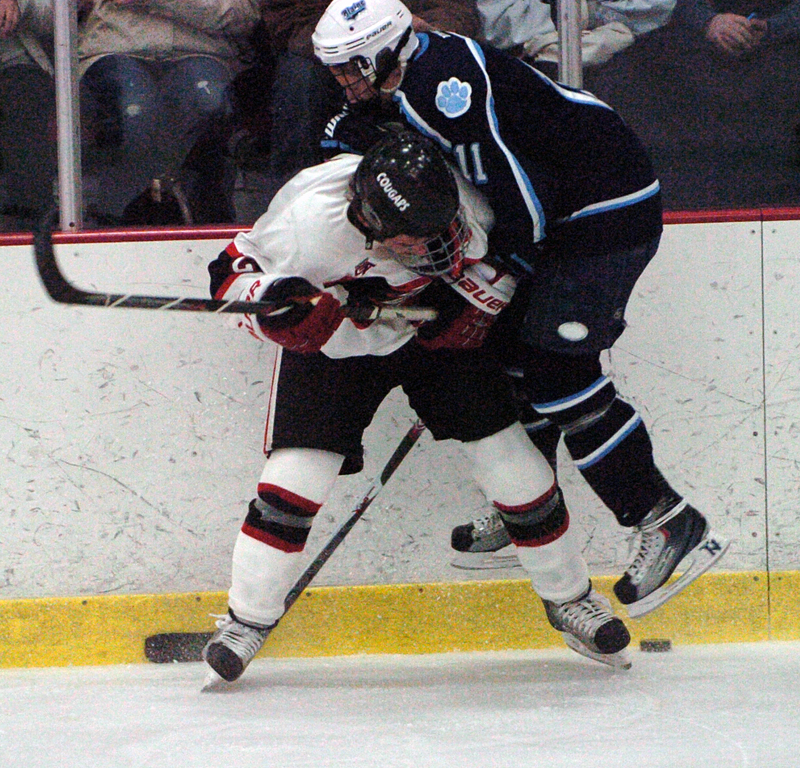 Ice bags were passed around in bulk to both teams after the game, further testament that this rivalry that is as contentious as any in the state. For the Cougars, though, the pain never felt so good. “We’re getting a little beat up,” Colvard said in explaining all the ice packs strapped to his teammates arms, legs and shoulders. And the victory, how did that feel? 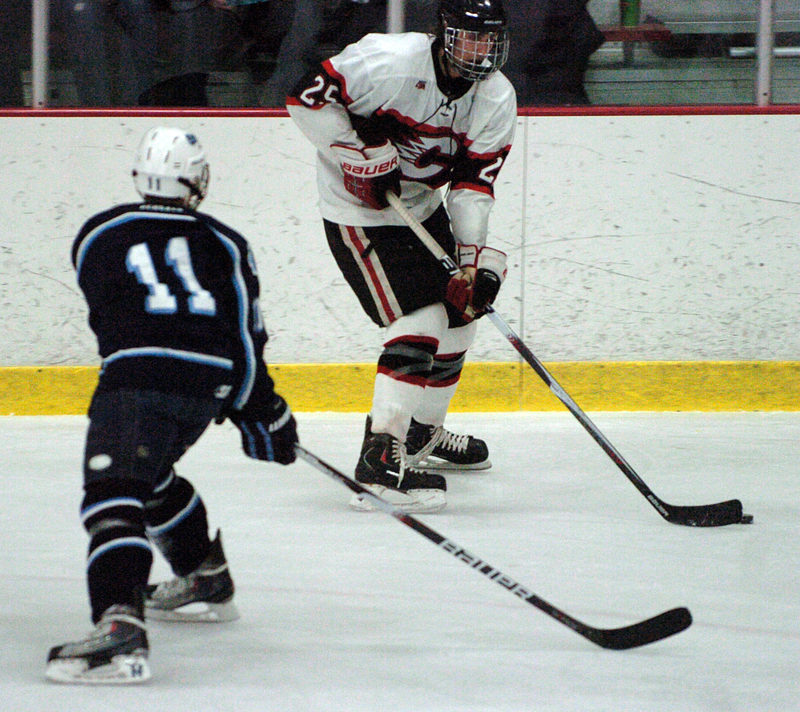 Lanky junior forward (pictured below) scored game-winning goal midway through the third period, banging home a loose puck in the crease. 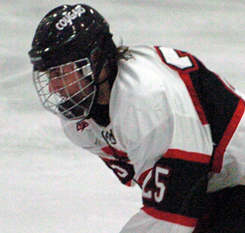 He also had an assist and was a big part of Cougars' top line that generated heavy pressure in the Blaine defensive zone all night. Junior goaltender made 22 saves, and only four in the third period, but he still was a big part of the emotion-charged victory for the Cougars. The only two goals he allowed were on Bengals power plays. 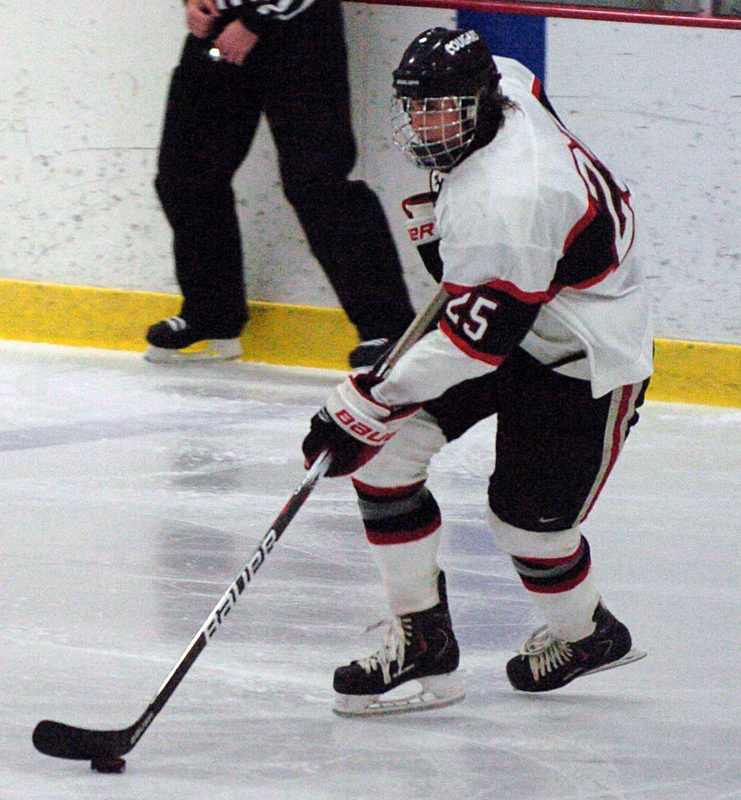 Bengals junior forward had a goal and an assist, showing both a goal-scorer's touch when he finished off a pretty three-way passing play and excellent passing skills on another Blaine power-play goal. 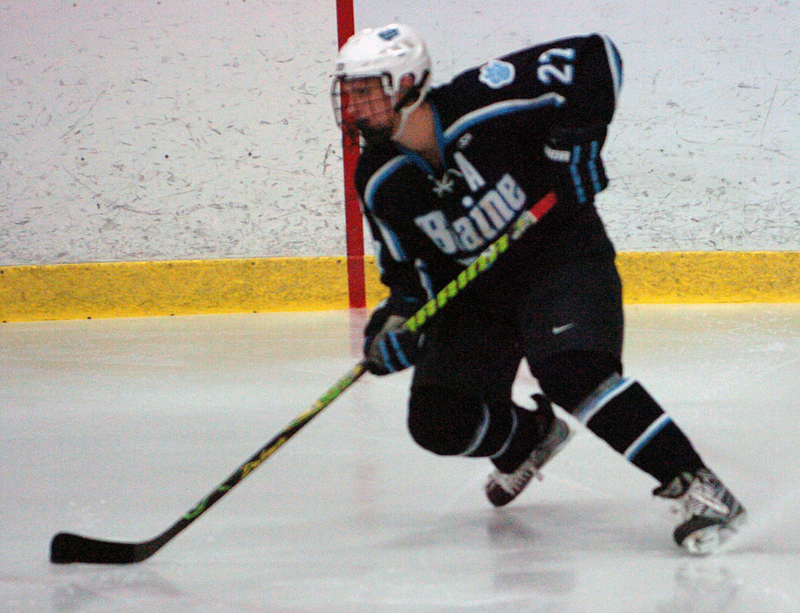 With the score tied 2-2 early in the third period, Blaine had a chance to take control with what would be the only power play opportunity of the period. But the Bengals, who are converting an amazing 40 percent of their power-play chances, were unable to generate many quality shots. 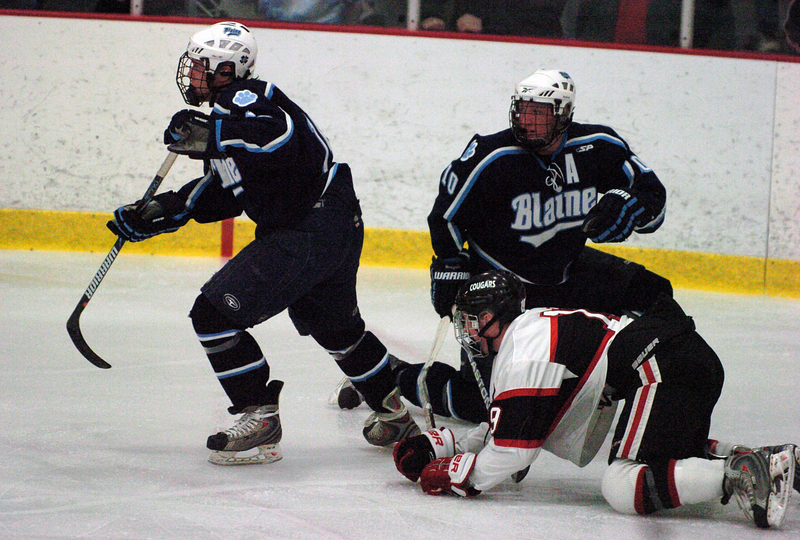 "Even on our power play in the third, there was just no fire like we usually have," Blaine co-head coach Dave Aus said. "I just think we looked tired, and I don’t know why. We have curfew every Friday, and they all called in by curfew." 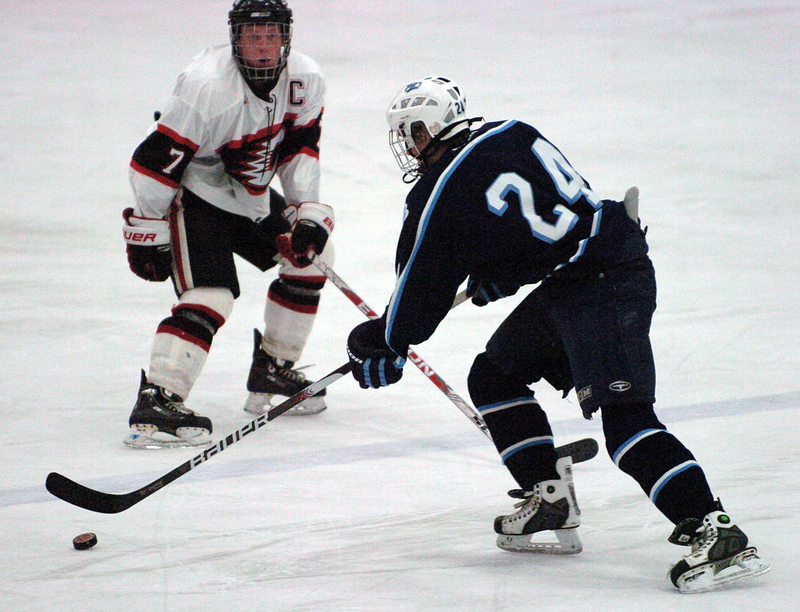 Centennial coach Erik Aus said holding the Bengals' scoreless on their third-period power play provided a boost to the Cougars. "We stopped their power play, and right there was a momentum changer," he said. "We got the winning goal not that long after that." 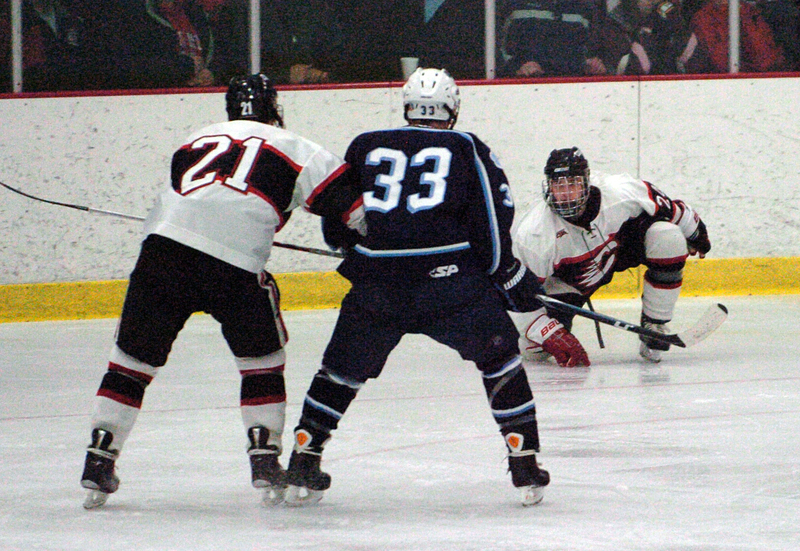 Riley Colvard scored the winner 25 seconds after Nick Huffman's holding penalty expried. 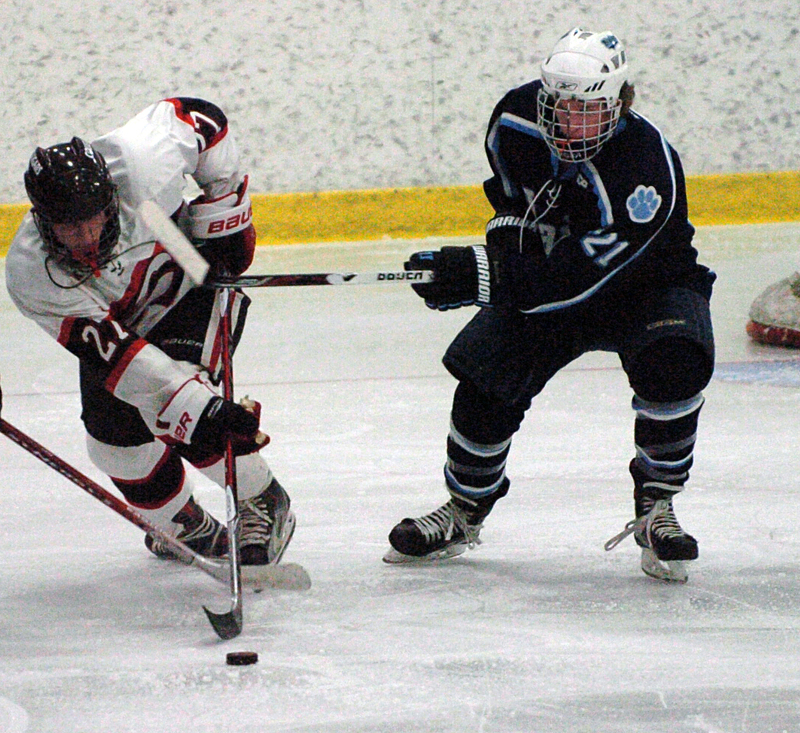 Centennial allowed just four Blaine shots in a third period that was played mostly in the Bengals' defensive zone. 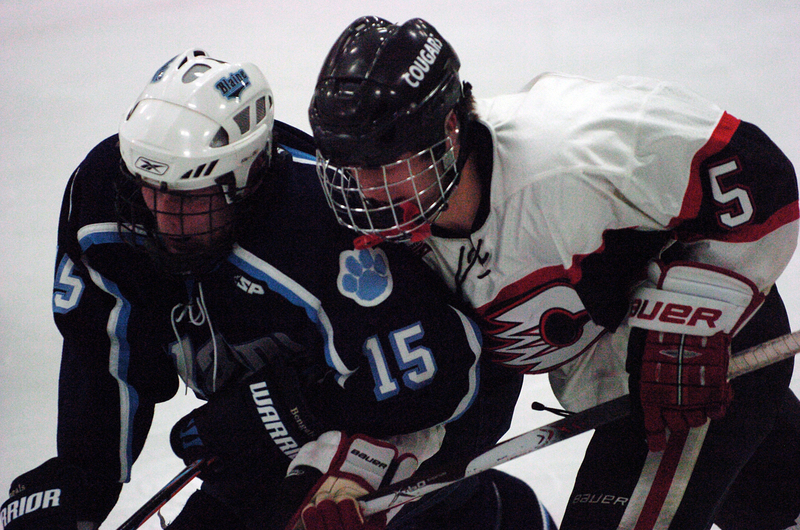 "They had a little flurry there when they were on the power play," Centennial goaltender Brett Larsen said, 'but other than that our defense kept a tight gap, our guys were backchecking and they didn’t give them many opportunities."